A fun way to document my adventures! Thursday was a great day to be a Lion! I met a lot of new friends at the Officer Training held in Powell! Attached are a few photos that I’ve received so far. . .
First, I had an opportunity to meet our current District Governor (DG), Jim McFarland and our incoming leaders. . . DG-Elect Steve Lewis and 1st Vice DG-Elect Bill McDonald. The photo with DG Jim and DG-Elect Steve has been added to my home page too! 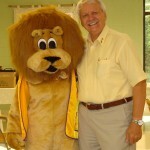 I also met International Director Bill Watkins from the Loudon Lions Club. His term is almost over, and he was training our District’s incoming Club Presidents. I met his wife Lion Nora, too, but she was on the other side of the camera taking pictures! 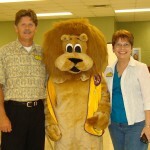 And, I got to meet Lions John Black and Diane Wilkerson. 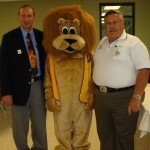 I think they are from the Powell Lions Club and hopefully, I’ll get a chance to visit with them again! I remember hearing about the Powell Lions 4th of July Parade. . . it sounds like a lot of fun!